If you’re involved in the business world and haven’t been living under a rock for the last twenty years, you’ve probably heard of a little program called Quickbooks. At its core, Quickbooks is just accounting software for small businesses, but it can do plenty more than just keep track of numbers for you. With that said, I’m not here to tell you about the great features and benefits Quickbooks can offer your business. I’m the one they call when things go wrong. The majority of Quickbooks problems I’ve seen are connection errors of some kind. 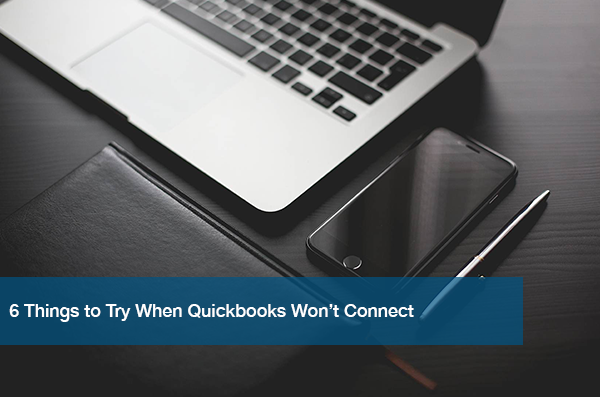 Here are 6 steps to do whenever Quickbooks won’t connect. Odds are that you’ve opened this company file before and it’s saved in your recent files list. Something may have moved or you may be trying to access a different file. It’s always best to double-check this before moving on with the more advanced steps. Close Quickbooks and wait for all instances of the program to close. If you’re connected to the company file on a server through something like RDP, log out too. You can even reboot your computer and the server computer to cover all your bases. Once you know everything is closed, go ahead and log back in if necessary and reopen Quickbooks. Now, try opening the file again. Sometimes that’ll be enough to fix the connection problems. If those steps didn’t work, we’ll move onto the serious troubleshooting. From this point onward you may need administrator access on the computer hosting the Quickbooks file. Log into the server computer and run a scan with Quickbooks Database Server Manager. On Windows, open the Start menu, click “All Programs,” click the “Quickbooks” folder, and click “QuickBooks Database Server Manager.” Once it opens, make sure that your file’s location appears in the section titled “Add the folders containing your company files.” If it’s not listed, click the “Browse…” button and add that folder. Next, click the “Start Scan” button in the middle of the window. After the scan completes, try accessing the file in Quickbooks again. That didn’t work, huh? Let’s run the Quickbooks File Doctor on the server and the workstation. You can find it through Quickbooks in the top menu bar by choosing File > Utilities > Repair File and Network Problems… Browse to the company file giving you problems, make sure the “Check both file damage and network connectivity” option is selected, then click “Next.” Quickbooks will run several checks on the file and network configurations and repair or list instructions to repair any problem it finds. If you’ve made it this far and you’re still having issues, it might be time for the nuclear option. Save any open work you have and reboot the server computer first. Once it’s back up, try connecting with the workstation again. Still no luck? Reboot the workstation and try again. If none of these steps fix the issue, try uninstalling and reinstalling Quickbooks on all affected computers. You may also have an issue with your network hardware, especially if you notice other connection issues. See if you can open other company files hosted on the same computer. If all else fails, you may need to restore from a backup. You DO have backups, right? If you need to set up a cloud backup solution, check out this post on why backups are important for small businesses. Hopefully this post has been of some use to you. If you’ve followed the steps above with no luck, give us a call! We offer remote and onsite support to get you back up and running ASAP.